Like last month’s sport topic, ricochet, spinning is a decidedly modern activity. Best of all, the only thing you need for spinning is a firm resolve to do something for your health or physique. But you can expect to work up a good sweat. THE PROGRESSIVE nature of spinning is also borne out by the fact that people speak of it not only as a sport, but also as a lifestyle. Here we’ll deal more with specifics, so those new to spinning will have a good idea what they’re getting into. A bicycle – an exercycle that meets specific criteria: pedalling without freewheeling, fine resistance regulation, full seat and adjustability for handlebar height and spacing. Group – a good group supports good motivation. After a while you’re sure to find someone to compare progress with. Instructor – coach and DJ in one. A demanding job, as it’s not easy to bring the varying performances of participants into harmony, even in small groups. The instructor may praise and criticize, but above all he or she has to spur the class on to get the most out of the spinners. Condition – a simple, entertaining way to stay or get in shape. Even utter novices can take part; there are no complicated movements. Figure – during one 45-minute session you burn 400 to 600 calories, twelve times as many as during aerobics – with less stress on your joints. Regular sessions help effectively shape and tone your body especially from the waist down. 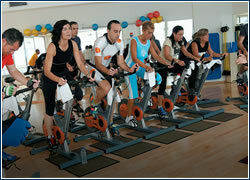 Training – spinning allows specialized preparation for various types of sports. It’s regularly used by NHL hockey players to improve their condition because of its high efficiency. Prices for a lesson, usually 45 to 55 minutes of exercising, range from CZK 65 to about CZK 100, but some centers offer discount passes. You usually have to reserve a “place” ahead of time. marketing & event manager, Holiday Inn Prague Congress CenterWhat makes spinning so exceptional for you? Is the exercise you get from spinning really so extreme?